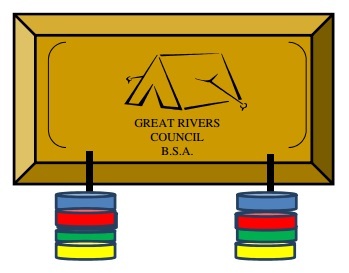 Scouts in Great Rivers Council, get earn colored beads every time they go camping. Beads and the coup can be purchased at the Scout Shop. Light Blue can be used for OA Conclaves, training weekends, Starkenburg, etc. Those who organize district, council, and high adventure trips are encouraged to supply the proper color been to all participants as part of their fees. It is *encouraged* that one pair of beads be given per activity. Some units may elect to give one bead per night, however this is not the official policy of the Lodge. Beads are to be given for ANY troop activities, i.e. Campouts, Service Projects, Day Hikes, etc. The COLOR to be given for each activity, if more than one is possible, is at the discretion of the PLC. Cords are sold only as a set with the Totem.